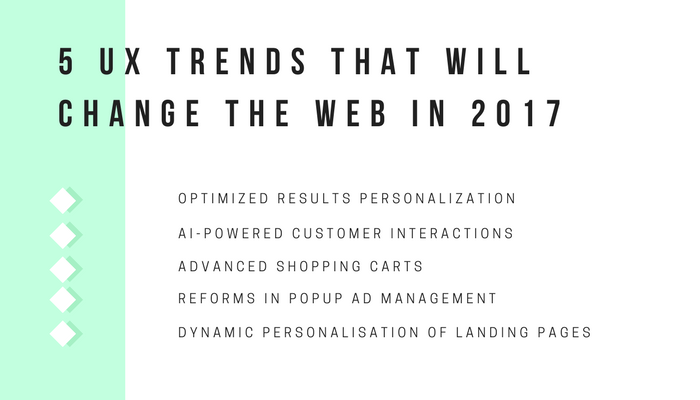 With an increased prevail of AI services and personalization over static UX, 2017 holds a lot of changes for desktop and mobile design that are going to change the way users interact on the Internet. This article takes a closer look at some of the top UX trends for 2017 and discusses their expected effect on user experience design in the upcoming years. Ever felt like your whole social media feed shares your opinion? While in the past, social feeds were formed by a combination of diverse sources, nowadays, the over-personalization of results has created an unexpected trend. Social channels now present lists of overlapping opinions that strictly match the user’s taste and preferences. This phenomenon was especially evident during the 2016 presidential elections in America and the Brexit vote, where thousands of people were supposedly exposed to a media environment that solely supports their own way of thinking and rarely displayed information that’s different from the user’s expected preferences. In 2017, personalization is going to take a huge turn towards optimizing search results and social feeds. According to Ignas Rubezius, co-founder of MailerLite, conversational interactions design going to become an integral part of the future UX. The advancements in artificial intelligence have taken a prevail over how we interact with the Internet. During the last couple of years, AI-powered virtual assistants like Siri, Cortana, and Ok Google have completely changed the user experience on both mobile and desktop devices. Nowadays, artificial intelligence is being adapted to everyday customer interactions via chatbots and engagement bots. The use of chatbots helps to create a more streamlined sales process that combines immaculate customer service and sales generation strategy management. Engagement bots, on the other hand, engage users into activities, like purchasing a product or service, browsing personalized content, participating in community discussions, and more. The new era of UX design will be based mainly, if not even entirely, on customer interactions. The way visitors engage with a website or a mobile application has been one of the biggest concerns of UX in the past years, and in 2017, we’ll going to witness some massive changes in this sector. One of the biggest points of interest in the modern UX world is not persuading customers to purchase products but actually creating a streamlined buying process that encourages upsells. In 2017, more businesses are going to take a look at how shopping carts can be better optimized to generate more revenue and answer the demands of the modern customer. Commerce UX is going to focus more on bundled offers and cross-sales during checkout as methods for increasing revenue and keeping customers engaged with the business. Clever popup ads management will become an indispensable part of the 2017 SEO Strategy along with branding and content optimization. Just until recently, popup ads were an advertisement approach that, despite being fairly annoying, was completely accepted by the major search engines. This was until Google decided to make some changes. The initial statement of the search engine giant on popup ads was that modal overlays were acceptable only if they open in the same window. Yet, from January 2017, Google has adopted a new policy on popup ads that completely changes mobile UX. While age verification is a reason enough to use full-screen interstitials cookies and popup ads, on the other hand, need to follow specific rules. This includes providing a clear opt-out button and generally taking less space on the page to avoid disrupting the browsing experience. Despite the fact that these changes are currently viable only for mobile search, UX predictions for the upcoming years show an increased focus on optimizing ads for desktop, as well. According to Tomas Jasovsky, product manager leading the InVision LABS team, landing page design in the upcoming years will head towards providing user-centered content based on specific preferences as well as demographics. With the increased focus on UI and UX personalisation, during the next decade websites will steadily stray away from the one-fits-all approach and adapt user metadata to create an optimized browsing experience. Metadata will be used to help easily identify unique visitors and target personas. Based on age and other specific needs, websites will offer a stripped-down interface with adjusted font size, brightness level, and spacing to accommodate the needs of users with special needs. This includes creating landing pages optimized for the eyesight of the elderly or people with color blindness.